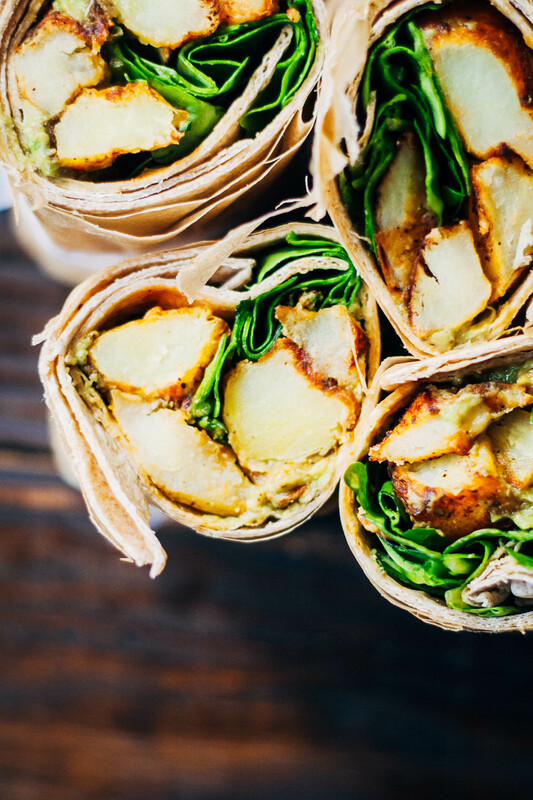 Healthy, easy Vegan Potato Wraps. Hey-o! How’s it going, everyone? Does anyone have any fun plans for Memorial Day? My boyfriend’s band is playing in a gig on Saturday night, and then we’re going hiking and camping from Sunday – Monday. My kind of weekend! As I get older, I find that I care less and less about how my weekend would look to someone else. 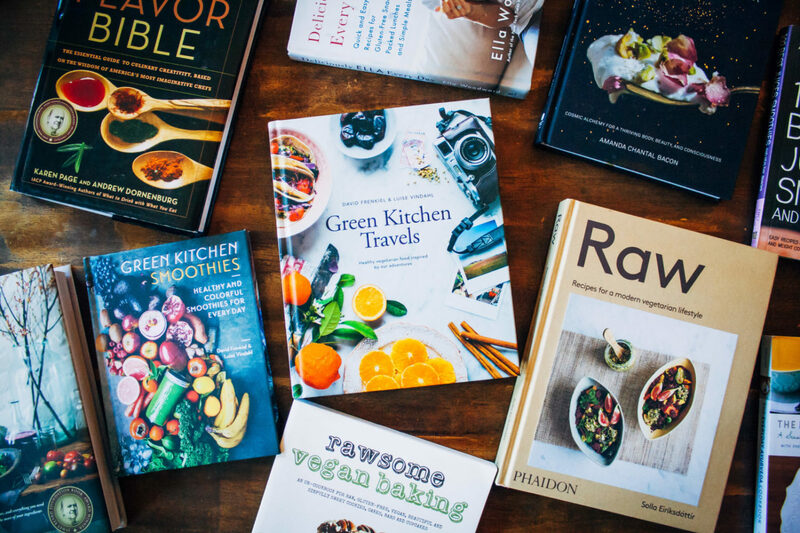 I’ve talked about this before, but for the past few years I was a part of this group that was very much entrenched in a certain lifestyle, desperately doing everything they could to not be “basic”. I guess they were going for hipster, if you were to put a label on it, but I never really found out what being “basic” entailed. Everything was about doing something epic, extreme, etc. Everything was deemed to be an “adventure”. And I’m not trying to bad-mouth these people, but it was a very oppressive mindset that it took me a while to break out of. These people literally refused to do certain things, even if they liked them, because they were what “basic” people would do. Yuck. Nowadays, when it comes time to choose something, I ask myself first – “Why am I doing this? Is it because I truly enjoy this thing/activity?”. I used to try to force myself to go to the bar with my friends because they were all into it. But I’d much rather get pizza and beer with my boyfriend and watch a superhero movie than go to the bar. Adopting this new mindset has been really freeing, and takes a lot of pressure off my shoulders. I was also really inspired by this post by Lee From America, one of my favorite blogs. In it she talks about the societal pressures that surround drinking, partying, and clubbing. It’s really hard to meet people nowadays who aren’t into that. I’m not trying to diss anyone who likes alcohol and partying, but there IS an undeniable social norm for people in their 20’s to go to the bar and drink. I used to feel like a loser because I wasn’t into it. But now, I embrace my “boring-ness” (although I think it’s anything but), and read my kindle or go camping on Saturday nights with abandon. I should probably say something about these wraps, shouldn’t I? ;) These easy vegan potato wraps are a riff on my favorite vegan wraps, except the spices/insides are a little different. But this wrap is super customizable, and you could put in a bunch of other stuff that would be tasty as well. These would be delish with garlic or red pepper hummus and hot sauce, or barbecue sauce and sautéed red onions. Plus, you could definitely keep these in the freezer for a few weeks, and take one out when you’re packing your work lunch. 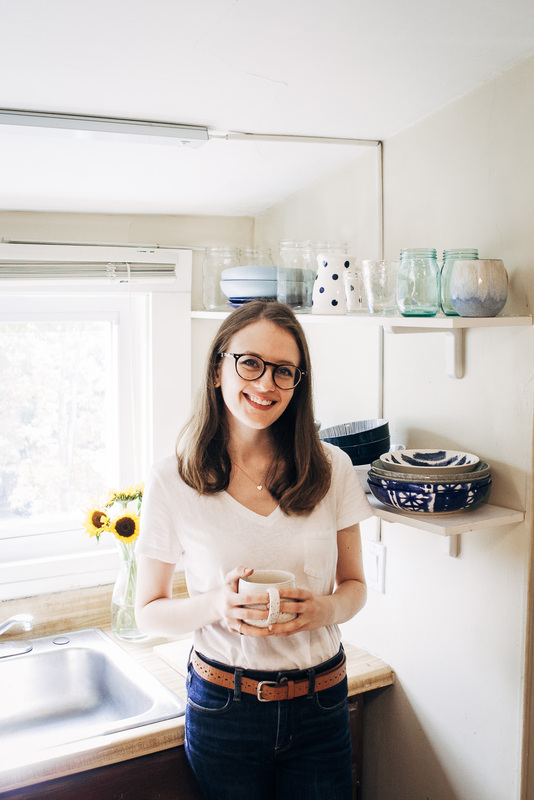 I love meals on the go, and this one doesn’t disappoint! Cheers! 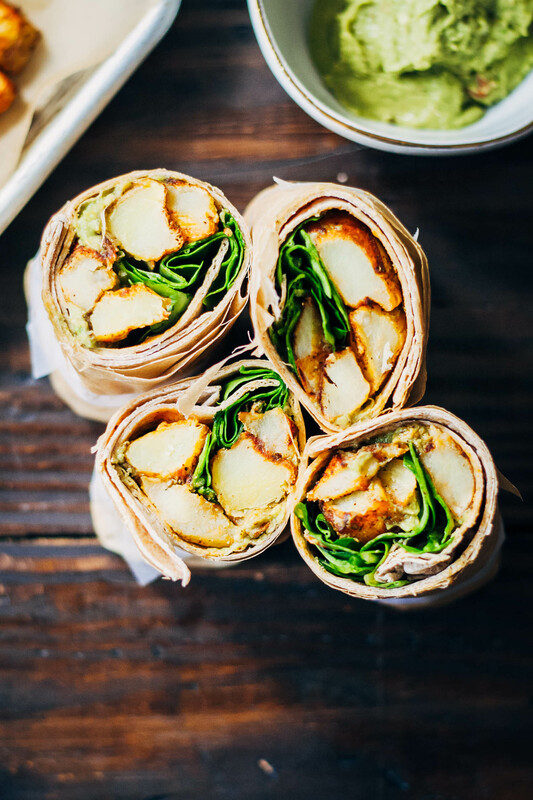 These easy vegan potato wraps are perfect for lunch or a meal on the go, and are super fast and easy to throw together! Any other add-ins you like! Wash and dry your potatoes. How many potatoes you need will depend on what size you use - yellow, red, or russet potatoes are fine! Chop up the potatoes so you have approximately four cups of 1 inch-sized potatoes. If you have a little more or less, that's fine! In a bowl, mix the chopped potatoes with enough olive oil to just coat them. Add in the salt and spices and mix until potatoes are evenly coated. 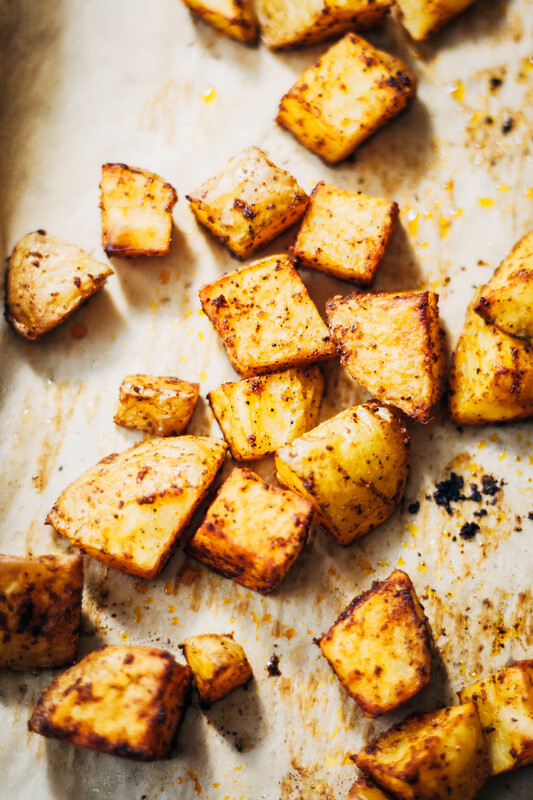 On a baking sheet lined with parchment paper, bake potatoes for 40 minutes, stirring halfway. Make your wraps. On a whole wheat wrap, add on a layer of guacamole. On top, add potatoes, greens, and any other toppings you like. Fold them into wraps, and enjoy! I used guacamole for these wraps, but other additions would be great - try hummus, baba ganoush, barbecue sauce, or any other spreads you like! I made these for lunch last week and absolutely loved them! Super flavorful and easy. No your fine Sarah! Thanks!